Warmly welcome to the second edition of annual Meera Art Exhibition in Munich, Germany! Since 2018, around Meera’s birthday, we celebrate her art and teachings through this rich event in Munich, Germany. During four days, Meera’s art will be exhibited in different forms of visual arts and various workshops around painting, family constellation and meditation will be held. The theme for this year is “Japanese Spring”. Throughout the event, visitors will have the chance to savour a beautiful atmosphere, art, music and Japanese tea as in harmony with the theme. Herzlich Willkommen zur Meera Art Exhibition in München! Wie schon im Jahr 2018 möchten wir auch dieses Jahr, in der Zeit um Meera's Geburtstag, ihre Bilder und Kunst in München zeigen und ihre Arbeit als Kunsttherapeutin präsentieren. Passend zum Thema “Japanischer Frühling” wird die Ausstellung vor allem verschiedene Bilder und Interpretationen der blühenden Kirschbäume in Japan zeigen. Meera kreierte hunderte von Bildern unter den Kirschbäumen - in voller Blüte und Farbenpracht, bei Nacht und Mondschein in wunderschönen Blautönen, jedes zeigt eine andere Stimmung und Energie. Wir freuen uns, Euch zu sehen und mit Euch gemeinsam die wunderschöne Atmoshpäre, Kunst, Musik und einen japanischen Tee zu genießen! You will find the event location (Atelier Benad) at a very beautiful square in Munich: the Bordeauxplatz in the historic district of Haidhausen. Listed rows of historic buildings, countless restaurants and cafés, the German museum, the beer garden on the Wiener Platz, the Philharmonic hall, the Isar (river) meadows and much more within easy walking distance: a traditional urban environment that inspires artists creation! The venue is located in the inner city of Munich in the area Haidhausen (“French Quarter”), in close proximity to the “Ostbahnhof” (Station), with all Munich subway lines (S-Bahn) and many buses, trams (short-distance) and many long distance trains. Meera held trainings every summer in Amalurra since 2005. So when we come to Amalurra we walk in the footsteps of the hundreds of others that have painted here before us. We step into a field of creativity and awareness that has been built over more than a decade. This is an 11 day Art Therapy and Painting training in Amalurra, in the heart of the beautiful Basque country in northern Spain. This is an opportunity for total immersion in Primal Painting, Self Portrait and Nature Painting over two weeks. This is followed by 3 days of self portrait. A process developed by Meera to touch our inner being in a vibrant and sensitive way. A process which brings us in contact with our inner strength and beauty. Along the way we include the practice of portrait painting in a joyous and loving way to build connection and understanding. In the final week we paint in the gardens, orchard and “jungle” nature of Amalurra.. Outside we experience the raw spirit of this beautiful place and add our own colours to the masterpiece that nature has already created here with the river, trees and plants. Facing nature like this gives us an insight into our own growth. Our emphasis is always on building awareness of our patterns and connecting to our own nature. Painting can be a mirror to see your unconscious motivations and tendencies. The magic of creativity can help release what you hold deep in your heart. By watching what the painting presents to us we can unlock authentic expression and in this simple process beauty may visit our painting. These 2 weeks are a unique chance to reconnect with the childlike innocence of the being through painting, meditation and group work. and participate in a training event presented by facilitators and staff who worked with Meera over many years. Part 1 July 22 to 27: Primal Painting and Self Portrait: Building on the essentials. Part 2 July 29 to August 2: Transformation in Nature: The inner experience of painting outside in nature. Both weeks may be booked separately. Thank you! I will be in contact very soon. Everybody longs for original and authentic expression and yet so few people allow this magical experience to be part of their life. There are many mistaken beliefs about creativity. When we try to create something beautiful according to the idea of others we move away from our authenticity. In this group we will unlearn wrong beliefs about creativity and re-discover our original playfulness and spontaneity. Meditation, painting, dance and play are part of our journey to find ourselves. Once we get in touch with our own energy source, painting becomes a reflection of joy and innocence. This group is designed to bring joy, love and awareness into family life. When parents and children share the space of creativity together they can learn from each other. By painting with their children parents will remember the forgotten language of spontaneous expression, creativity that comes out of joy and innocence. This can create a bridge between the hearts of all family members. In these 5 days we dance, paint, play and meditate. Sometimes parents and children will be together and sometimes we create a space for them separately, where all can follow their needs for expression and sharing. This unique group experience has originally been created by Meera. It will allow a new understanding between parents and their children to grow. As Meera said: “I want to teach the whole family what it means to be fully alive:”. The focus of this training is nature painting under the fully bloomed cherry trees. This time of the year is very special when mystery of nature is revealed with its life energy bursting into flowering. There, essence of meditation and creativity will be overflowing. When you paint with meditation, what you have in front of you is not just nature, but a master who reveals to you mystery of existence. For that, you will prepare yourself with active mediations, dance, and therapy work. Also, you will experience primal painting, black and white painting in darkness, painting with small papers, etc., through which, along with other exercises, you will explore your essential nature inside. Facilitators are Henna, Bhaven and Tosho. Henna was with Meera for more than two decades and has established reputation for her self-portrait work. Bhaven graduated from the same art university as Meera and has been exploring his own art as well as working with Meera for many years. He facilitated art groups in Pune. Tosho facilitated part of Pune training this year and is a translator of “Reawakening of Art” written by Meera. This will be a unique training where 3 facilitators will share their own individualities and experiences to present Meera’s work in its multidimensionality. Along with us, Svagito, who was Meera’s partner and is an expert of various kinds of therapy work such as family constellation, star sapphire and was a coordinator of OSHO therapist training in Pune for years, will join us as a guest and will share his understanding and experiences. The place training will be held is Noto where Meera was born and grown up. Originally this training was planned by herself. Many of her cherry blossom painting are the subject of cherry blossom of Noto. The hotel is located on a hill overlooking the sea. It has hundreds of cherry trees in its backyard. Luckily not so many people visit the place even during the time of cherry blossom and it is virtually left only to us to enjoy its full beauty. The hotel welcomes us with its gorgeous meals prepared with local, fresh fish and vegetables. It also has a natural hot spring. 人生の行きづまりから変容したい人、過去の傷やトラウマを癒したい人、自分の 創造性を見失っている人、自己の成長を促したい人、人生を遊びに満ちクリエイ ティブに生きたい人など、様々な方にお勧めです。 想像してみてください。今、あなたに劇的な癒しがもたらされたら、人生の新たな ステップがお祝いになるとは思いませんか? Family Constellations is a profound method developed by the German psychologist Bert Hellinger. It is a three- dimensional group process that has the power to shift generations of negativity. Svagito has been sharing the OSHO Family Constellation which is focused to gain our Love and Awareness by meditation and therapeutic way of the art. In this workshop we find systemic solutions for questions regarding our authentic expression in life and what blocks us from being creative. The more alive we are, the more creative we will be. Creativity is our birthright. However, often we are distracted from our true potential and look for secondary benefits that does not intrinsically arise from the activity we are involved in. For example sometimes we are overly focussed on money, status or material gain. When we can become less bound by systemic entanglements, we become more able to be in tune with our true life path. We will experience the insightful and great healing process with Meera ́s way of painting in this workshop. This unique approach of painting on the floor as an extension of our dance - splashing colors and water on paper out of spontaneity, enlivens our intelligence and brings us close to the source of our creativity. In this way painting is more like the remembrance of our childhood energy. It is without purpose or goal, just a pure delight of our energy. Once we allow this play- fulness, we are able to respond to the happenings in our painting intelligently. The outcome of our painting becomes a gift. Hence the creativity become a great resource to heal and support our inner growth with Family Constellation. ・Certain destructive habits or repeating life patterns. ・Chronic disease or physical or mental difficulty. *Include 3meals/day and the entrance of natural hot spring. Inspired by OSHO this training was developed by Meera over nearly 40 years. 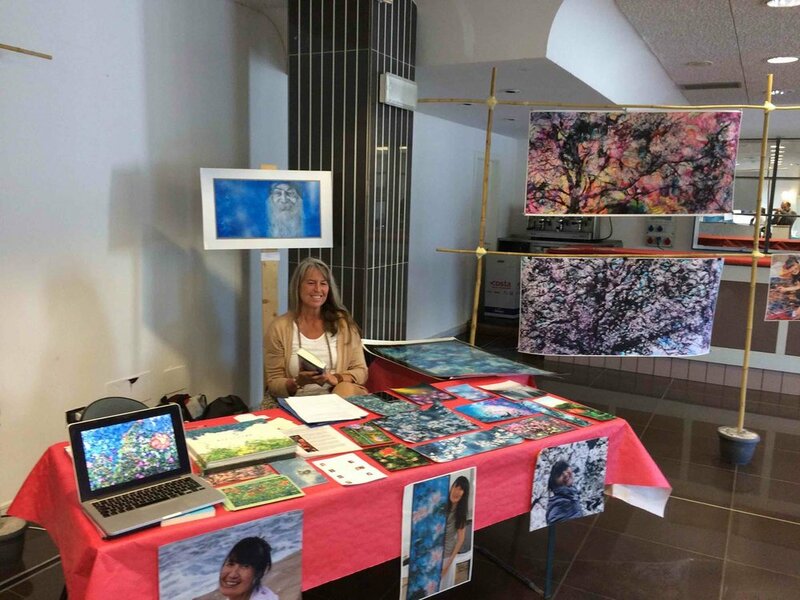 It brings together her unique approach to art and art therapy during a 23 day intensive. It will be facilitated by a team who assisted Meera over many years and still continue to share her work in many parts of the world. We will paint outside on a marble platform in the shadows of the bamboos surrounding the Buddha Grove. As we deepen our meditation the focus is not on learning technical painting skills, but somehow painting skills follow like a shadow as we allow ourselves to surrender into the process of the training. The creative process can not only be enjoyed as an activity, but the same creative process may also be used to examine and deal with life issues. No other medium can penetrate so directly into our unconscious as the process of painting a picture. Our journey will begin with Primal Painting which looks at the basic psychology of creativity and what prevents us from true creative expression. In Self Portrait we make a deep investigation of inner beauty and take a close look at our resistance to encountering ourselves. Through dance we approach the difficulty of painting the human figure and introduce this subject in a playful and joyous way which makes us question our relationship with our own body. In the last segment we examine our part in the nature that surrounds us. As we paint the trees and plants we reconnect with a forgotten part of ourselves that can only be rediscovered through the world of nature. The training will end with an exhibition and performance which will celebrate life and creativity. In this workshop we will use Meera's insights on how to bring the creativity, spontaneity and innocence hidden inside you out into the world. During the exhibition there will be a slide presentation and a video presentation of her work by Svagito and a presentation of her paintings. The exhibition will be accompanied by a conversation and a multimedia presentation by Svagito at the opening event, and on Friday, November the 30th, a painting workshop will be held according to Meera's vision. On the last day of the event, Svagito will lead a day-long Family Constellation workshop. IBIZA - NATURE PAINTING OPEN STUDIO. Arriving November 10th for Dinner. Starting November 11th at 8:00h with “Dynamic Meditation” Until November 17th after breakfast. Nature Painting, Black & White ( Light & Darkness ) Open Studio. Mostly after all painting groups we go "ohh .. am just starting to paint". This group is exactly fore those who want to dive deep in painting. There will be a loose structure but you are free to participate to whatever suits you in the moment. This group will be really fun and like a true old times Meera painting training. (without art therapy). We will dance , paint , sing ,swim, and go on paint excursions to amazing spots of the Ibiza Island. back to you. All that you need to do is stay open and watch. In this group we will explore our creativity and what hinders our uunlimited expression. It is an experience of personal growth, meditation and painting while discovering our true origin. Through play, dance and exercises based on primal painting, we will expand our creative expression into unfamiliar and new dimensions. We will look into and unlearn what has been learned, we will take the freedom let go, unblock and free ourselves from the constraints and labels. Then painting happens by itself out of no mind. This course is residential and it lasts for 6 days, 7 nights. Double rooms are available which includes three meals per day and coffee and tea. The course will take place as a retreat in a high standing villa on the island of Ibiza, very close to the town of Santa Eulalia del rio. All the bedrooms have that country chic feel to them. With its lush tropical gardens-fragrant fruit trees, water features, swimming pool and fish pond, the house and grounds are the perfect place to enjoy your retreat.There are plenty of areas where you can enjoy some ’me time’.The much loved porch, overgrown with lilac wisteria in the summer, iswhere you can sit and read while overlooking the large private pool and take in the delights of the beautiful gardens. Meditation” Until November 10th after breakfast. CONTENT: Primal Painting, Dancing Painting, Black & white, Moving into form. “Dynamic Meditation” Until November 17th after breakfast. Much Love! Premraj, Gyan & Anando. This is a 5 day retreat to reawaken our creative potential and come in touch with both the inner and outer nature through painting, dance and meditation in the unique, magical setting of Karakaya on the Aegean Coast of Turkey. These courses are continuation of Meera's work, inspired by her clear vision of meditation, painting and therapy, developed through continuous spiritual quest and total devotion to Osho. Among the courses she created “Primal Painting” is the master key to original expression. Everybody longs for original and authentic expression and yet so few people allow this magical experience in their life. There are so many erroneous beliefs on creativity and on so called artists. We don’t realize that by trying to be somebody, we are going far away from our authenticity. In this group our approach is from the opposite end, how to unlearn what we think we know and learn how to be playful and spontaneous. Creating one’s own being is the priority. Once one gets in touch with one’s own energy source, painting is just a reflection of joy and innocence. Meera is suddenly gone, but she is still here with us, in the depth of our hearts. In line with her vision her work will continue. Her workshops will continue in Miasto, first of all the work with children and parents "Creativity and Innocence", where in addition to her team of historical assistants, Svagito will also be present, an expert in Family Constellations, who for many years has coordinated the Osho Therapist Training in Pune, India. 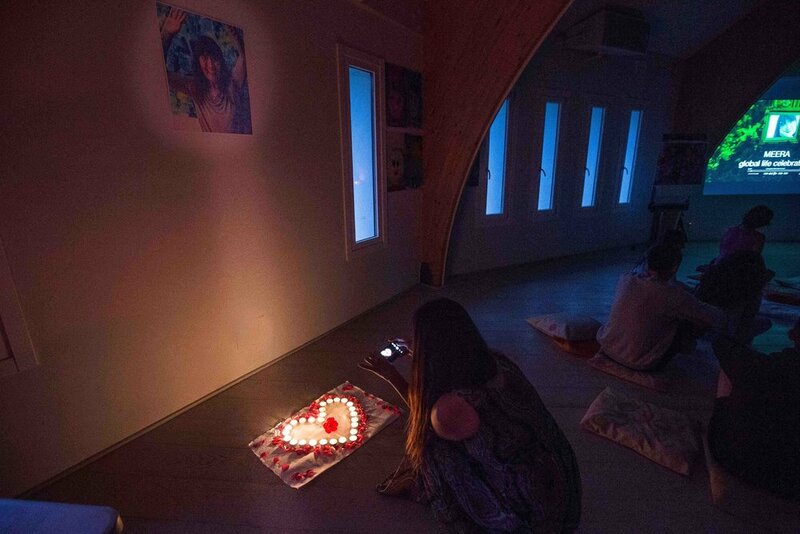 These workshops are dedicated to her and her generosity for giving us a vision so clear about meditation, painting and therapy developed through constant spiritual quest and a total devotion to Osho. This group is designed to bring love and awareness into family life. The parents and the children sharing the space of creativity is so precious. By painting with children you will remember the forgotten language of spontaneous expression. What Osho calls Creativity is not coming out of your mind but out of joy and innocence. And once you bridge to this innocent space in you, you will bridge to the very heart of your child. We dance, we play and we meditate. So come and join the caravan of Osho Love, playfulness and, Osho Life in Miasto where you can taste of osho's work directly. Children can join the group along with parents, relatives or teachers. 12 days Art Therapist and Painting training in Amalurra, in the heart of the Basque country Spain. This is the longest such training in Europe this year and an opportunity for total immersion in Primal Painting, Self Portrait and Nature Painting over two weeks. A chance to reconnect with the childlike innocence of the being through painting, meditation and group work. The first week gives us the space to reconnect with ourselves and our own creativity and in the second week we experience our inner and outer nature by painting outside in the beautiful orchard, woods and gardens of the Amalurra community. A unique chance to participate in a training event presented by facilitators and staff who worked with Meera over many years. The exhibition is open daily from 10 am to 9.30 pm. Free Entrance. us to live our creative potential and how to overcome such hindrances. Relax into your true self, play with colours and meet the innocence and curiosity of a child. Through dance we will explore our creativity and aliveness. how to open to unknown and sometimes painful challenges (personal questions are welcome). Donations are welcome and will be credited to the Meera Art Foundation. Everyone has a longing to create and express their own uniqueness. For many this is a secret wish that we never act out. Our heart is always there to remind us of the other side of our nature perhaps a wild, unique, and playful side that longs for expression. Once this creativity is released it finds its way into every aspect of our nature and in every act of our being. During these 3 days we look at the basic psychology of creativity and removing those blocks that prevent us from expressing out authentic self. We use a process of working with people, therapy, painting, dancing, self-enquiry and meditation all in an atmosphere of spontaneity and playfulness. Painting on the floor with acrylic paints and water we experiment with our own individuality and connection to creativity. Art Therapist Training held in Noto for the last 10 years has always been one of Meera’s most favorite trainings. This year the training will be presented by 3 facilitators and Svagito with the help of the team of people who have been supporting the work for many years. All three facilitators have been supporting Meera for years and deepening their meditation and creativity. Svagito is Meera’s partner and a world-famous therapist. Obviously, the focus of the Noto training is nature painting under the fully bloomed cherry trees. This time of the year is very special when mystery of nature is revealed with its life energy bursting into flowering. There, essence of meditation and creativity will be overflowing. The place training will be held is Noto, Ishikawa prefecture which is located in the northern middle part of Japan. The hotel is located on a hill overlooking the sea. It has hundreds of cherry trees in its backyard. Luckily not so many people visit the place even during the time of cherry blossom and it is virtually left only to us to enjoy its full beauty. The hotel welcomes us with its gorgeous meals prepared with local, fresh fish and vegetables. It also has a natural hot spring. Ordinarily, Nature Painting means a direct translation of nature into colors and forms. In this approach, painting of nature is like a bridge from the is-ness of nature to your being. Like a sculptor taking away the unnecessary parts of the stone to reveal a unique piece of art, this process is a strong confrontation with one’s conditioning. True art has nothing to do with technique, but with returning to a sparkling innocence inside. Sitting silently around Buddha Grove will encourage you to find this precious space within, and out of this space painting is pure joy. Dance and painting are both expressions of our creative life force. Dance gives painting more movement, and painting gives dance more color and depth. Painting on a big sheet of paper on the floor allows you freedom to express yourself in a new way, different from conventional methods. Take this invitation and you will connect with your body, with your joy, with your meditation. Face yourself, moment to moment, while discovering or deepening your painting skills. Doing a self-portrait is a powerful experience, and at the same time a healing. Where you may have learned to look away from yourself, you will end up embracing and welcoming yourself with open arms. And you come into deeper touch with your natural, original being. Side by side you will learn to paint the beauty of the human figure in dance. The healthy inner child in us never dies. We have “buried” this child alive under our conditionings and teachings we received. We will put a spot light on the wounded child inside us, who had to decide to stop expressing itself fully in order not to get hurt again and again. You can't separate expression and life. In this course we will say YES to the healthy child and embrace our wounded child inside us. Painting on the floor and splashing color and water will give you the remembrance of the innocent and healthy child living inside you. A 21-day intensive that combines art and art therapy. It is about much more than learning technical painting skills: you will also experience how with deepening one’s meditation, painting skills follow like a shadow. While you will be able to enjoy your creative process, at the same time that creative process will be used to look at and deal with your life issues. No other medium can penetrate so directly to our unconscious as a picture does. An Exhibition and Performance is scheduled on 31 January - 1 February 2018. After Helsinki and Stockholm we had a big event for Meera at the largest festival in Scandinavia at Angsbacka, Sweden. Meera was so present and people loved to get a taste of her work and art. I am so grateful that I can share her with so many people! Anubuddha and Anasha were also there, what a great surprise! At the end of the first week of the Meera Painting Training we did a celebration for Meera, where we let go of some of her ashes into the little creek, where she used to paint. It was so touching and so beautiful to be in Amalurra and paint there with all those loving people. Sahaja, Ojas, Premraj and Tosho did a great job in leading the course and the helper team was also phantastic, just like everyone gave his best. I feel so grateful about the way it all happened. Every year the trees waited for Meera to come and paint them. Now they will not need to wait, she is always around and so many beautiful souls will continue to paint them. After a presentation in Oslo I was actually leading my first half day painting workshop at Osho Risk, Denmark. I can't believe that I even did a small painting demonstration. Meera must have giggled behind my back. I used to be in the audience in her Demos, now she was in the audience with a big smile! We had a wonderful and touching book launch and party for Meera's Japanese book edition in Tokyo on Oct 21, exactly 8 month after Meera left her body! Thank you Gatasansa, thank you Jun, thank you all the painters, musicians and helpers! Together with Rama we also established the Meera Art Foundation Japan!